Catherine Tapales is crowned the 2018 Astoria Regatta queen. Astoria Regatta Princess Danielle Morinville embraces Catherine Tapales after Tapales was named the 2018 Regatta queen. The 2018 Astoria Regatta Court gave speeches to the audience at the Liberty Theatre during the coronation ceremony. 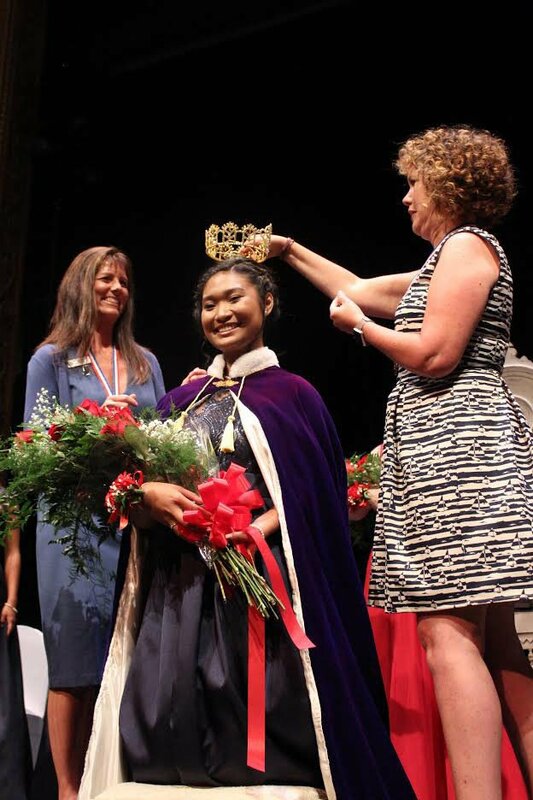 Catherine Tapales of Warrenton High School was crowned the 2018 Astoria Regatta queen on Wednesday night at the Liberty Theatre. Tapales was chosen queen by a panel of judges after the four Regatta princesses answered on-the-spot questions and delivered speeches. The Regatta Court has spent most of the year giving the speeches, all of which touch on Astoria heritage, to groups in the community. Tapales described the work and lives of Coast Guard crew, tugboat pilots, bar pilots and fishermen to the crowd at the theater without a hitch. Tapales will succeed the 2017 Regatta queen, Megan Postlewait. In her farewell speech, Postlewait thanked the community and the Regatta for giving her confidence and helping her grow. She will attend Clarkson University in Potsdam, New York, in the fall to major in computer engineering. “This amazing community that has grown beside me, strengthening me, teaching me, has made me who I am,” Postlewait said. While Postlewait looks forward to meeting new people, she said she will miss the Regatta Court and the Astoria community next year. The queen’s coronation signals the beginning of the 124th Astoria Regatta. The Regatta will continue with the Junior Parade in downtown Astoria at 6 p.m. on Thursday. The highlight is the Grand Land Parade downtown at noon on Saturday. While Tapales is excited to get started, she plans on appreciating her year as queen.